Guitarists, I think in many other chord resources, this particular major barre chord shape contains two barres: The index finger (1) from the A string to the high E string, and the ring finger (3) over the D, G, and B strings. However, I don't usually fret that chord that way, so what's diagrammed above is how I play. 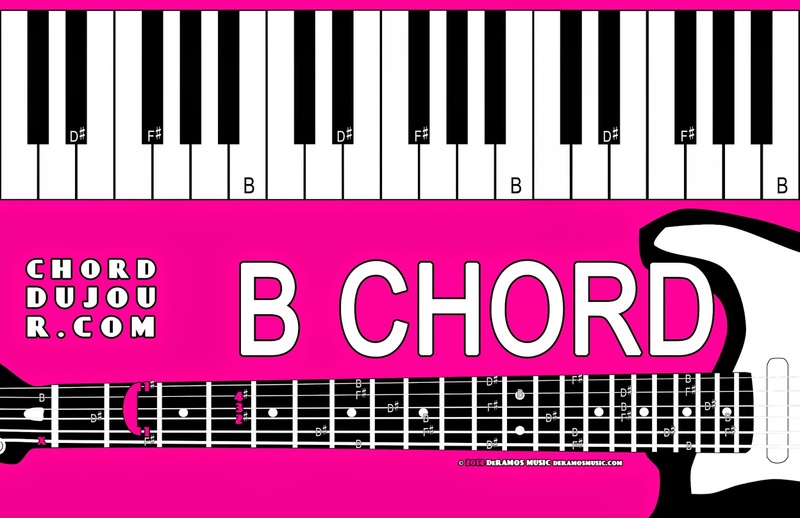 Keyboardists, in the B chord, B-D#-F# is the root position of the chord. D#-F#-B is what's known as the first inversion, and F#-B-D# is the second inversion of the chord. It's helpful to know these alternative note orders, especially when switching from chord to chord. Instead of playing the root position up and down the keyboard, you can keep your hand(s) in relatively the same spot by playing root positions and inversions at your convenience. Guitarists, as you may have noticed, I tend to rely on two moveable chord shapes for diminished triads -- one with the root note on the low E string (i.e., G#dim, etc.) and one with the root note on the A string, like the chord shape above. Keyboardists, as you may have noticed, D? triads are formed with a D? note, an F? note, and an A? note. The ? denotes -- ha, pun! -- the use of an accidental symbol (b, #, etc.) or no accidental. For example, D#dim is D#-F#-A. 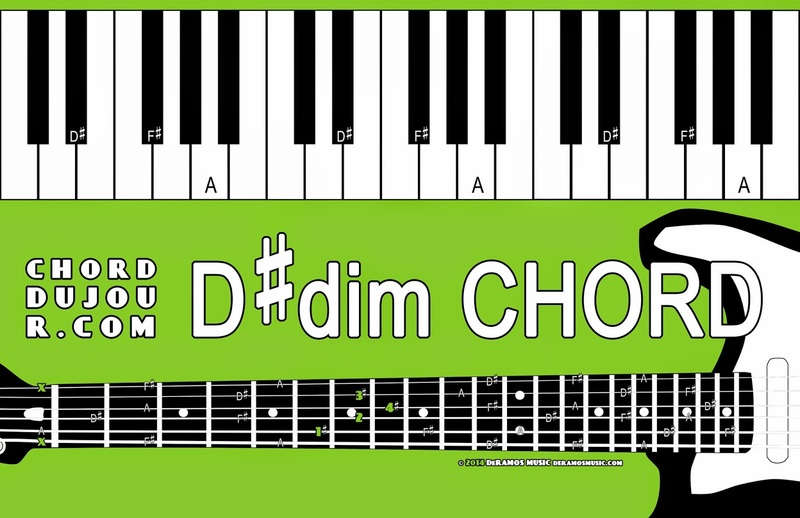 The D major chord is D-F#-A. Dm is D-F-A. Similarly, E? triads are E?-G?-B? ; F? triads are F?-A?-C? ; G? triads are G?-B?-D? ; A? triads are A?-C?-E? ; B? triads are B?-D?-F? ; and C? triads are C?-E?-G? notes.